A Certified Nurse Assistant’s primary duty is to help patients with personal hygiene and daily living needs. CNAs may also monitor vital signs, assist with movement, and provide emotional and physical support when needed. Washington’s state approved nurse assistant training programs equip students with the skills to support patients’ personal hygiene needs and assist with the activities of daily living. They also learn how to provide adjunct care to administer enemas, non-sterile dressings, heat treatments, and restraints. 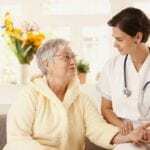 In a long-term care facility, CNAs answer patient call lights, document details related to the patient’s reaction to medication, and adhere to the professional standards of the profession. A prospective CNA should have a good bedside manner, excellent communication skills, a desire to care for others, and an ability to multi-task. The nursing assistant training program at the Health Care Training Center offers 112 classroom and clinical training. The curriculum includes 7 hours of HIV/AIDS education. Day and evening schedules are available for students’ convenience. Daytime classes are three weeks’ long while the evening classes are seven weeks in length. Applicants should contact HCTC to schedule a free consultation prior to admission. The school is open for new registration from Monday through Friday from 9am to 3pm; to register after the free consultation, prospective students must make a down payment, complete the registration form, and provide a photo for the student file. As Spokane’s longest running CNA provider, HCTC offers professional experiences instructors, extensive resources, lifelong support, and state and federal funding. Graduates are eligible to take the NAACP exam at HCTC’s approved testing center. Tuition for the program is $750 and includes registration and HIV/AIDS education. The textbook and course materials cost an additional $100. The nurse assistant training program at the Newtech Skills Center equips students with the skills to begin a career in the medical industry. The program is specially designed for persons 16 to 20 years old who have yet to receive a high school diploma. The program is offered in partnership with local high schools, giving students the opportunity to receive career training that they can use after graduation. During the program, students learn vital signs, medical terminology, treatment of common diseases, patient communication, first aid and CPR, infection control, professional standards and regulations governing practice, measuring and recording data, and HIV/AIDS training. Students also participate in 50 hours of patient care under the supervision of a registered nurse during the clinical component of the training. Tuition is free. The nursing assistant training program at Spokane Community College meets the state’s requirements with over 96 hours of classroom and clinical experience. Graduates are eligible to take the NNAAP exam to become a Certified Nurse Assistant. In the classroom, an experienced nurse instructor covers infection control, communication, medical terminology, ethics in practice, mental health, safety and emergency procedures, rehabilitation, and personal hygiene. The clinical experience at a skilled nursing facilities begins after students cover 16 hours of essential theory in the classroom. In line with the state’s requirements, the program also covers HIV/AIDS training. Applicants must be 18 years or older with a high school diploma. Proper documentation of MMR, TDaP, Varicella, and Hepatitis B must be submitted for clinical placement. TB testing, a physical exam, criminal history check, and drug screen are other requirements for clinical placement. New Chapters Healthcare Education prepares students for certification as a Nursing Assistant through the Washington State Department of Health. The curriculum emphasizes competent and compassionate care for patients or residents in hospitals, long-term care facilities, and patients’ homes. It consists of 120 hours of classroom and clinical instruction that spans a period of 3 weeks. The classroom component of the program includes lectures, videos, classroom projects, discussions, HIV/AIDS training and CPR certification over 60 contact hours. The 20-hour clinical lab provides students with the opportunity to practice clinical skills in a simulated environment. The clinical component is 40 hours of direct patient care in two different medical settings. Students care for patients under the direct supervision of a licensed practical nurse or registered nurse. The tuition is $750 ($825 from May 2016) and includes textbook, HIV/AIDS certification, CPR certification, uniform, TB test, and professional skill building/resume builder. Mental Health/Dementia Care certification is available for an additional $75. Graduates are eligible to take the CNA competency exam at New Chapters NACES approved test site. The following state-approved training providers may offer free CNA training for prospective employees.